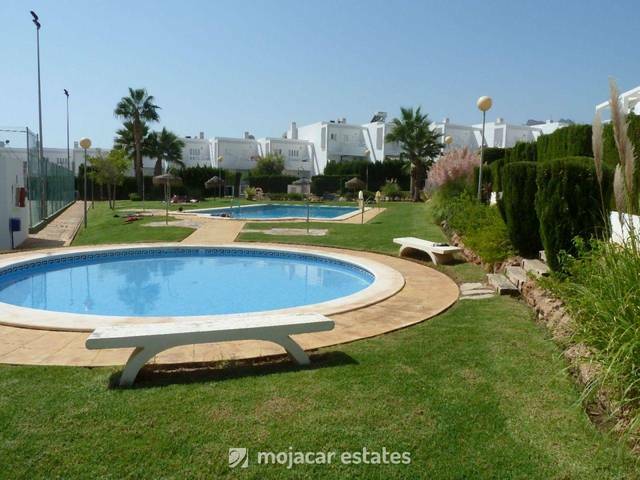 Casa Lux- Semi-detached town house a stone's throw to beach and amenities in the area known as Las Ventanicas in Mojacar Playa. The house has an entrance terrace, partially covered with built in BBQ, and table & chairs for outside dining. The ground floor comprises lounge-diner, fully equipped kitchen, one bedroom with 2 beds, a bathroom and at the back there is a tiled patio area. Internal staircase leads up to the top level where we find the ensuite master bedroom with covered terrace with sea views. Another full bathroom and 2 bedrooms, one with double bed and other one with 2 single beds. Roof terrace. Air co unit in 2 of the bedrooms and cveiling fan in the others and in lounge.